You are currently browsing the archives for the Thad McCotter category. It’s been too long since I’ve heard from Rep. Thad McCotter. He was one of my favorite congressmen because he was a thinker with a sense of humor. Thanks to this article, McCotter is back better than ever. 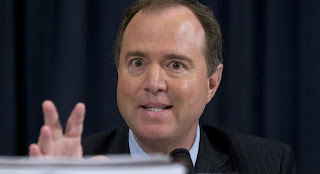 Whenever Rep. Adam Schiff, (D-CA), would get in front of a microphone, which felt like 4-6 times a day, he’d talk about President Trump’s collusion with Russia. Each time he’d do that, I thought Rep. Schiff was just attempting to keep that fake story going. I thought that the Agenda Media, aka the MSM, dutifully picked up this BS to maintain their good standing as a member of the Democratic Party. The truth is I’m still certain the MSM willingly provides irresponsible coverage of this nonstory. My radio colleague John Batchelor has pegged U.S. Rep. Adam Schiff (D-NY) as “the Pathfinder.” The reason being that, as ranking Democrat on the House Intelligence Committee, Schiff has been most vocal and visible in trying to divine the truth behind the alleged collusion between the Trump campaign and Russia—and, in a fortuitous confluence of circumstances for Schiff, find a path to taking Sen. Dianne Feinstein’s Senate seat. And how the Left-wing applauds and approves! For the media elite, ratings, circulation and “clicks” soar; and the Pathfinder treks ever closer to his coveted senate seat. Yes, their off-Broadway/on-Beltway production of “Trump Done It (Whatever It Was)?” is the smash hit of the post-Obama season. Whether it’s Susan Page, Julie Pace or Mara Liasson, they keep saying that, unfortunately for the Trump administration, this story isn’t going away. What they’re really saying is that the liberal media elites, like themselves, aren’t willing to let go of this juicy clickbait of a non-scandal. Let’s be clear about this. The media wing of the Democratic Party is perfectly content to ignore the lack of proof to further the Democrats’ agenda. The bad news for Democrats is that the people don’t trust the media because they’re convinced that the MSM is dishonest and hyper-partisan. Ergo, in the real world, the Trump campaign’s collusion with Russia or the president’s attempts to “obstruct” justice. Sadly for them, Pathfinder Schiff, the Left and their colluders in the media elite have concocted a kitchen sink thriller with a villain—President Trump—and with no plot to pin on him. Russia-gate isn’t a scripted play as much a fundraising dinner theater of the absurd wherein the Democratic Party and the media elite’s Trump Derangement Syndrome is passed off as performance art. Fortunately, for the future of our free republic (and dinner theater everywhere), the nonpartisan public isn’t buying tickets. While some people are buying tickets, those who aren’t on the left aren’t. “Simply put, the President’s economic policies have failed. With over an 8.5% unemployment rate for the past 34 straight months, a $15.2 trillion national debt, and the lack of a Senate budget for the past 1,000 days, it’s time to put American workers first not crisis politics. We can and must do better. The President promised to cut the deficit in half during his first term, meanwhile the past three years have produced the largest budget deficits in U.S. history. The President says ‘we can’t wait,’ but he then rejects the Keystone XL Pipeline and creation of 20,000 jobs. In the meantime, American taxpayers are on the hook for the $500 million he awarded to the bankrupt solar panel manufacturer Solyndra. “President Obama’s inauguration was a historic day of hope for America. At the time, I expressed a desire shared by many for Washington to put principles above partisanship. Unfortunately, Americans have since grown accustomed to failed policies and broken promises from the White House as 14 million have fallen victim to 35 straight months of unemployment greater than 8 percent. “The rhetoric of the past three years has not matched reality: This administration has given us stimulus spending that created debt, not jobs; health care “reform” that has led to 10,000 pages of business-stifling regulations; an activist National Labor Relations Board (NLRB) with the power to tell businesses where they can and cannot create jobs; and the audacity to circumvent the people’s elected representatives by granting No Child Left Behind waivers to states with special strings attached. “Tragically for the American people, in our unfolding globalized century the President remains wedded to a failed “Great Society” government: specifically, Washington elites dictating who gets someone else’s money. For the sake of our country’s economy and security, this President must learn that the great American tradition isn’t redistributionism; the great American tradition is exceptionalism. I’m actually very disturbed by the speech tonight. The President is on the verge of committing economic malpractice. How does raising taxes create jobs? How does raising my boss’s taxes help me keep my job? Why is he advocating policies that will punish people that are investing in American businesses that are creating middle class jobs? It just doesn’t make a lot of sense. It’s the kind of policies that have taken a bad economy over the last four years and made everything worse. Tonight, like millions of Americans, I was disappointed to hear more of the same from this president: more borrowing, more spending and more taxes, which stood in stark contrast to the common sense message of fiscal responsibility and reform from America’s best governor. Gov. Mitch Daniels’ plainspoken call for fiscal discipline and reform was the right message during these difficult times and must be heeded if we hope to put an end to the mountain range of debt that threatens the prosperity of our children and grandchildren. We have a crisis of work in this country and tonight President Obama proposed nothing in the way of policy changes that will get us to robust job creation and dramatic economic growth. Instead, the president described his conviction that his big government is built to last and should be paid for with higher taxes. Here we have to confront the truth about President Obama. Economic growth and prosperity is not really at the top of his agenda. He will always prefer a food stamp economy to a paycheck economy and call it fair. For the president and a large part of the political class, it’s about their power, their right to rule. They just want to take money from Joe the Plumber, the small business people who makes over 90 per cent of the new jobs, and redistribute it to the government bureaucracy and their political friends and allies. That’s why so much of that nearly trillion-dollar stimulus didn’t create jobs but just went into the pockets of special interests who support President Obama and the leadership of the Democratic Party. No better example of this exists than in the crisis of American energy. President Obama and his political allies, not of few of whom love living in energy inefficient houses or driving gas-guzzling luxury vehicles, openly admit they want gas prices to remain high so that the rest of America will learn to live more modestly. They think it’s good for rest of us. Only recently, the president canceled the Keystone XL Pipeline that would have created countless new jobs and helped America on the way to energy independence because he wanted to appease the far left of his party. And yet not a single word on the Keystone XL pipeline tonight. To create jobs and growth in this country, we must start with dramatic tax reform that lowers taxes and maximizes capital investment and job creation. We must return to a dollar as good as gold whose purchasing power is the same in thirty years as it is today. We must dramatically expand American energy production. We must have smarter regulation at the same time we abolish destructive and costly regulatory systems beginning with Obamacare,Dodd-Franks and Sarbanes-Oxley. And finally, unlike the current administration, we must have faith in job creators. With these policies the state of the union will be much better. They will create an explosion in job creation and lead to robust economic growth and a return to prosperity. Furthermore, a paycheck economy will put us on a path to balanced budgets and paying down our national debt. My own impression of President Obama’s speech was that he must’ve been beamed down from the Starship Enterprise to have made some of the statements that he made. When he talked about the military returning home from WWII, he talked about soldiers using their GI Bill benefits to get the training to build a great an prosperous nation. What he did’t say, though, was that the level of regulations then was miniscule then compared with now. If President Obama wants to return to the policies of that era, then let’s roll the regulations back, too. Otherwise, the comparisons don’t fit. Nonfarm payrolls rose only 18,000, the weakest reading since September, the Labor Department said on Friday, well below economists’ expectations for a 90,000 rise. “The message on the economy is ongoing stagnation,” said Pierre Ellis, senior economist at Decision economics in New York. “Income growth is marginal so there’s no indication of momentum. Nonexistent income growth says that people are just treading water. That’s a far different picture than the White House has tried painting. Readjusting the jobs report downward is proof that employers aren’t buying the Obama administration’s happy talk. The economy is the top concern among voters and will feature prominently in President Barack Obama’s bid for re-election next year. So far, the economy has regained only a fraction of the more than 8 million jobs lost during the recession. “Today’s report is more evidence that the misguided ‘stimulus’ spending binge, excessive regulations, and an overwhelming national debt continue to hold back private-sector job creation in our country,” House of Representatives Speaker John Boehner said in a statement. This isn’t the news that this administration needs. Mr. Axelrod knows that they’ll be history if the unemployment doesn’t improve dramatically over the next year. Raising $1,000,000,000 to spend on the campaign won’t matter if unemployment stays this high. Over sixteen million Americans are unemployed. Over thirty million Americans are unable to pursue better jobs because of the failed stimulus and other irresponsible, job-crushing policies. Inflation is rising. Real wages are declining, everywhere except at the Obama White House. To Mr. Obama and Mr. Romney’s big government and bailout banks, this is an economic statistic. To Main Street, this is real suffering. This must and will end. This isn’t rocket science. Capital isn’t being put at risk because businesses are worried about the potential costs that Obamacare and the Dodd-Frank bill will impose on them. Until those things are repealed, this economy will stay stagnated. This doesn’t even qualify as spin. This is denial on the scale of Baghdad Bob. The “prism” of GDP and the unemployment rate are precisely how Americans evaluate the economy. They don’t give a damn if the President makes decisions “based on me and my family” if those decisions turn out to be disastrous, and right now, that’s the case presented in the latest economic slide. Plouffe’s argument seems to be that people will vote for caring incompetence, and while that may be the only argument left for Obama’s re-election, Plouffe and company are about to find out that denial isn’t exactly a winning strategy. Plouffe’s statements seemed tin-eared at the time he made them. Today, they seem downright insulting to America’s intelligence. They know President Obama’s economic plans have had ample time to put people back to work. Plouffe and Axelrod can buy all the clever ads they want. They can’t counteract the negative news that this administration isn’t up to the job of creating jobs. The only remedy to this jobs crisis is to put President Obama on unemployment next November. Anything short of that will lead to declining employment throughout the rest of the nation. That’s what presidential petulance sounds like. Paul Ryan’s budget plan is dominating the conversation in DC and across the nation. This is undoubtedly upsetting President Obama. He isn’t used to being overshadowed, which is what’s happening this week. During the FNS Roundtable discussion, Mara Liasson said that a) the Ryan Plan wouldn’t be the only budget on the table and b) the Gang of Six budget would play a prominent role in the 2012 negotiations. After President Obama’s hyperpartisan speech at GWU this week, there’s no indication that either statement is true. Liasson’s opinion was a traditional opinion. She just didn’t take into account the fact that President Obama doesn’t change directions or make adjustments. Those concepts are foreign to him. President Obama’s speech, pre-billed as a major economic address, was yet another platitude-filled speech devoid of specifics or policies. That’s leading to the feeling that President Obama’s grasp of policies is, to be polite, limited. People don’t argue that he’s a gifted speaker. Lots of people question his policymaking abilities. Right now, we don’t need a gifted orator in the White House. What’s needed are gifted policy people. Chairman Ryan dominates President Obama in that arena. Just utterly dominates him in that realm. The debate over fiscal policy will prove critical to the 2012 campaign and Obama sought to frame it as a “stark choice” between investing in the future or watching the country fall apart. “Under their vision, we can’t invest in roads and bridges and broadband and high-speed rail,” Obama told a select group of the Democratic faithful at the second of three fundraising events in his hometown of Chicago. High-speed rail is a boondoggle in most of the nation. It’s a waste of the taxpayers’ money in all but a few instances. It certainly isn’t the type of thing that’s on the nation’s entrepreneurs’ front burner. Spending hundreds of billions of dollars on infrastructure after this administration’s policies exploded the deficit and the debt isn’t warranted. New projects might get headlines but just maintaining road and bridges is what’s needed, both from a needs standpoint and from a fiscally prudent standpoint. President Obama still hasn’t heard what the American people said this last election: that they want government doing less and spending less. In President Obama’s insulated world, there’s a belief that the federal government has to spend tens of billions of dollars, that without that spending, the economy would falter, possibly even stop in its tracks. The two biggest job-creating administrations the past quarter century were the Reagan administration and the Clinton administration. While there’s no denying that they spent lots of money and that many of their policies were dramatically different, the reality is that their success is attributable to bringing down business costs, then getting out of the way. They understood, like Chairman Ryan, that the best news for entrepreneurs is stability and low operating costs. President Obama’s pattern is the polar opposite of those models. He’s rejected them outright. His policies haven’t worked because he’s implemented policies that raise operating costs. Too often, he’s insisted on micromanaging industries. “If we apply some practical common sense to this, we can solve our fiscal challenges and still have the America that we believe in,” Obama told supporters at Chicago’s N9ne restaurant. To most people, living within one’s means means cutting back. This administration thinks it means spending whatever it thinks is necessary to implement their radical vision. Further, this administration’s talk about “investing in the future” is their euphemism for saying they aren’t slowing down their reckless spending binge. President Obama’s call for applying “some practical common sense to this” is a throwaway line implemented because it tested well in focus groups. This administration’s policies don’t have anything to do with common sense or propriety. PERIOD. President Obama is the most radical president in this nation’s history. He’s also the least qualified person ever elected to this office. What people haven’t totally noticed is that the recession ended over a year ago. This is the so-called new normal where the American economy supposedly can’t soar. It’s time we reject that notion. President Obama’s policies have directly led to a) unprecedented deficits, b) gas price spikes, c) stagnant economic growth and d) doubt amongst both consumers and investors. We don’t need 4 more years of that junk. We need 4 straight years of straightening out this administration’s messes and implementing an economic plan that puts America back on the right track. Most importantly, it’s important that we vanquish this administration into history. That’s the only way we’ll return to the prosperity of the old normal. Over the weekend, Rush Limbaugh, Sean Hannity and Mark Levin weighed in on the spending cuts Speaker Boehner negotiated with President Obama, saying that Speaker Boehner caved. MCCOTTER: Well, I think you hit the nail on the head at the beginning where you said how long it took the budget bill before. Even though I didn’t vote for it, I do respect the efforts that were put forward and it certainly wasn’t the fault of Speaker Boehner or anyone else that the cuts weren’t as large as people wanted. You have to remember the intransigence of the Democratic Party in the Senate and the White House that led this issue to be prolonged that led to the resolution being less than what people expected in many quarters. As we move forward, the budget battle will be key and what I think we have to focus on is the difference between the two parties. I’m certain that Rush, Hannity and Levin are sincere in their beliefs. What I’m driving at is the fact that politicians don’t have an unlimited amount of political capital. Speaker Boehner must’ve made the determination that this wasn’t the fight to expend all of his political capital on. Rather than being upset with him, these leaders should be thankful that Speaker Boehner is husbanding his capital in such a way that he’ll have alot left when the big fight happens. People talk about political battlefields that politicians should fight and die on. In this series, that battlefield shouldn’t be the 2011 budget. It shouldn’t even be the debt limit debate. The ‘Armageddon’ battlefield is the 2012 budget. Let’s be clear, though, that the debt limit debate is a great opportunity to extract more spending cuts. WH Press Secretary Carney said yesterday that Congress should raise it now rather than dragging it out to the last minute. There are lots of Republicans who oppose raising the debt limit. Most of them think that we shouldn’t just raise the debt limit without gaining reforms that dramatically slow our spending. I agree that we’ll eventually have to raise it but there’s too many things that the federal government does that should be eliminated. Finally, it’s time GOP legislators put lists together of specific budget line items targeted for elimination. Those lists should include that line item’s budget. When (Yes, when, not if) the Democrats complain that items are miniscule, that Republicans’ cuts are tiny and unimportant, the reply must be this question: Why should government waste of any size be acceptable? I’m not giving Speaker Boehner a final grade because we’re still working the process. At this point, I’m giving him an incomplete because I want to see the results of the debt ceiling and 2012 budget fights. My goal is to support GOP leadership as much as possible without relinquishing accountability oversight. Put another way, give them the opportunity to lead without second-guessing their every move while demanding accountability. That’s how the TEA Party gets its accountability without destroying the GOP. SHAWN: You know, we saw how bitter getting this deal done was, $38,000,000,000, some Democrats accusing Republicans of wanting to kill women, that it’s a war on women, that’s a war, bombing innocent civilians. I mean, what can we expect when we’re dealing with this type of rancor when we’re dealing with the debt limit? MCCOTTER: First, thank you for repeating all that. Second, I think what it shows is the difference between the two parties. I think as we’ve talked, Eric, I think America knows that in the 21st Century, we can’t simply prolong Lyndon Johnson’s legacy. What we’re seeing all around us is power devolving into individuals’ hands through the commications revolution, people making their own decisions, control their own money. The Democrats are still locked in their 1960s, 1970s big government, fully centralized, making your decisions for you. The very fact that they can’t adjust their minds to the very time we live in is the cause for the histrionic and I’d say irresponsible rhetoric, or what they’d call the new civility. SHAWN: Well but they would say that many people rely on these programs. Paul Ryan’s program, they say, will gut Medicare and Medicaid and that if you’re under 55, you’re gonna get slammed on Social Security. So how do you go forward when dealing with this very contentious issue? MCCOTTER: Well, I think when you talk about the Ryan plan, whether you agree on the particulars, one, it shows that Republicans are serious about the entitlement reform problem and two, we have serious ideas to deal with it and three, the Democrats are seriously irresponsible in using vitriol in their remarks about Republicans when they didn’t even pass a budget in the first place, showing no interest at all in taking this issue on. Going forward, I think Republicans are just going to have to get used to, in many ways, it’s just going to be a conversation between ourselves and what the soveriegn American people wish to see because in the final analysis, we’re trying to offer a distinct vision between the two parties of the Democrats doing nothing and spending everything approach means that we’ll have bankruptcy. The Republican approach means that we’ll have solvency. SHAWN: Democrats say that they’re doing their part. The President hailed it as an issue of bipartisanship and shows that it can work. What next? You’ve got the $14 trillion. You’ve got the deficit vote. How do we trim this and get this under control? They want to keep in place the 1960’s 1970’s model of big government that’s no longer sustainable as every indicator shows us from entitlements going bankrupt to the overall fiscal state of the United States. Republicans may not have all the answers but we’re certainly looking. We’re certainly looking forward and that’s what going to lead to alot of rancor. You also have the situation where the House was entrusted to the Republicans by the American people but the Senate remained in Democrats’ hands because that’s what the people wanted last time. And you’re going to continue to see a cross-chamber discussion and you’ll continue to see, I fear, the White House sitting on the sidelines waiting to see what happens. Going back to this morning’s post, I agree with Congressman McCotter in that I can’t envision this president and this Democratic Senate actually leading. Democrats, unfortunately, have gotten into the habit of sitting on the sidelines criticizing everything that Republicans offer in legislation. In truth, on a litany of issues, the Democrats’ Song Remains the Same. The Democrats’ gameplan is to sit on the sidelines while criticizing everything that’s done in the hopes of Republicans screwing things up so they can look relatively acceptable to the people at some point in the future. For the foreseeable future, Republicans just need to maintain focus on what they’re already doing and keep making people like Thad McCotter, Paul Ryan, Dave Camp and John Boehner the face of the Republican Party, at least until our presidential nominee is picked. While the cuts weren’t as big as I would’ve liked to see them, one thing that isn’t deniable is that the debate has totally shifted to the Republicans’ terrain. It’s still important that TEA Party activists keep GOP elected officials accountable. Still, to contend that the terms of future debates haven’t significantly changed is a difficult proposition to defend. The Democrats have been exposed as being unserious about cutting spending in any meaningful amount, whether you’re talking Chuck Schumer, President Obama or Harry Reid. What the final results will be is still to be determined but TEA Party activists must be smiling about the change in the terms of the debate. The gist of Congressman McCotter’s speech was that the Democrats’ response to the budget reminded him of Led Zeppelin. He wondered if there’d been a Communications Breakdown. Then Congressman McCotter wondered if his hankering was because a senator was wearing a Kashmir sweater. Congressman McCotter was finally able to pinpoint the reason why he had this hankering. He said it’s because, with the Democrats, The Song Remains The Same. MCCOTTER: Once again, seniors and children wake to the hysterical, frightening visage of specters of doom and gloom…Democrats…Once again, we’re regaled to the Democrats’ entitlement reform plan. It is called “Do nothing, spend everything, go bankrupt. Benefits? Bye Bye. We continue to see a party that does not understand that you cannot lift an economy when it’s crushed beneath the weight of big government. We continue to see a party ideologically zealous on spending your tax dollars on Planned Parenthood to the point that they would shut down the federal government to do it. And we continue to hear that the fundamental crux of the issue of a government shutdown. The Democratic Party will shut down the government so they can spend more of your money. The Republican Party is committed to keping government open and spending less of your money. After listening to Congressman McCotter’s speech, I thought about what the American people’s response would be. I suspect that the American people’s response might best be summarize by another legendary rock song from another legendary British rock band. Seriously, I’ve never seen the American people more engaged, more outraged than I see them today. House wives who’d never paid attention to politics are suddenly leading the charge. They’re worried about their children’s education. They’re worried about their retirement funds. They’re worried about what effects the Democrats’ cutting $500,000,000,000 from Medicare will have on their elderly parents. Independents that voted for President Obama are often voting for Republicans by a 2:1, sometimes by 3:1 margins. While there’s a Pox on both their houses factor involved, let there be no mistake. The anger is directed more at Democrats than Republicans, not because Republicans are blameless but because they’ve started listening to We The People. That started with the TEA Party rallies. It intesified during the townhall meetings where Democrat politicians essentially told We The People that they should step aside, that the professional politicians would take care of health care, that they didn’t have worry themselves about it. It’s understatement to say that that wasn’t a wise decision. The Democratic Party shows no signs of recognizing the historic 2010 midterm elections. That’s a bad career decision. It’s a decision that’ll cost many of these Democrats their careers. Swing district Democrats that think TEA Party activists are getting apathetic will get defeated in 2012. They’ve pledged to not get fooled again. A new Rasmussen Reports national telephone survey finds that 57% of Likely U.S. Voters think making deeper spending cuts in the federal budget for 2011 is more important than avoiding a partial government shutdown. Thirty-one percent (31%) disagree and say avoiding a shutdown is more important. Twelve percent (12%) are not sure. Anytime you’re on the positive side of what’s essentially a 2:1 issue, that’s a politically strong position. This polling utterly refutes Harry Reid’s and Little Chuckie Schumer’s claims that Republicans’ positions are “extreme”. If Reid and Schumer think that 57% of likely voters are extreme, they’re welcome to make that argument. I’m betting they’ll quickly abandon this argument. This shows little change from late February when 58% of voters said it was better to have a partial government shutdown than to keep spending at current levels. The voters’ message this past November was unequivocal. They’re tired of DC’s reckless spending. Apparently, they’re fine with things if it takes a government shutdown to get that message pounded into the Democrats’ thick skulls. Most voters, as they have for years, say cutting taxes and reducing government spending are best for the economy. The partisan divide is predictable. Fifty-four percent (54%) of Democrats say avoiding a government shutdown is more important than deeper spending cuts. Seventy-six percent (76%) of Republicans, and 67% of voters not affiliated with either of the major parties, disagree. The fact that independents, by a 2:1 margin, are fine with a shutdown vs. reckless spending should get Democrats’ undivided attention. Now isn’t the time to compromise and betray the American people that spoke with such a loud, unequivocal, voice this past November. The polling shows that the American people haven’t changed their minds. Their principles haven’t shifted. George Will once wrote that “if the American people speak loudly enough and long enough, sooner or later, the leaders will follow.” Let’s hope Republican leaders in the House and Senate stiffen their resolve and tell Harry Reid and Chuck Schumer that their wimpy budget cuts won’t cut it with the American people. Let’s hope that they say that they won’t vote to betray the American people’s trust. If that happens, then this polling information will rightfully be seen as a Godsend. Last night, I interviewed Congressman Thaddeus McCotter, (R-Mich.) Congressman McCotter has recently written a book called Seize Freedom: American Truths and Renewal in a Chaotic Age. First off, I’d like to thank Congressman McCotter for granting me this interview. I’ve been a fan of his for several years, partially because of his keen intellect, partially because of his great love of freedom. Before I talk about the interview, though, I’d like to make this observation: As impressive as Congressman McCotter is on TV interviews or during floor debates on C-SPAN, he’s more impressive in person. This is the third time I’ve had the privilege of interviewing him. Each time, his wisdom has been impressive. One of the things we talked about was the great capabilities that social media gives us. Congressman McCotter said that “it would be a mistake for people to think that technology is all that’s required” to change life for the better. Congressman McCotter was quick to emphasize the importance of people taking ownership of their society, their state, their nation. Without their involvement, their passion, this current movement will lose its legs. It’s important to note, though, that he was just as quick to say he thought “social media is making it easier to sustain the current momentum”, saying that young people don’t know how much easier it is today than 20 years ago. I reminded Congressman McCotter of the first interview I did with him during the O’Care debate. I said that I remembered talking to him about how employers were holding off with their hiring decisions because they didn’t know the cost O’Care would impose on them. He remembers adding to that it wasn’t just the uncertainty. He said then that it would be just as bad if entrepreneurs found out the cost and that it was prohibitive. When I asked him about the current (self-imposed) gas crisis, Congressman McCotter said that the Republican plan was based on three things: robust domestic energy production, common sense conservation and letting free markets determine which alternatives should survive and which ones should be allowed to fail. He also said that Democrats were so wedded to their ideology that they think we should just go cold turkey and switch to green technologies. He said that he supports “an all-of-the-above energy policy” as opposed to a ‘green-or-bust’ philosophy. Whenever 2 conservatives talk about liberty in the context of foreign policy, one must include Ronald Reagan in the conversation. After I mentioned how President Reagan made a habit of talking to Soviet dissidents during his speeches, Congressman McCotter said that the power of Reagan’s words were proven by Natan Scharansky. When I said that Reagan was a handler’s worst nightmare, Congressman McCotter said that’s because he knew where he wanted to take the country and because he knew they were with him. Congressman McCotter also said that Reagan understood and appreciated America’s greatness, that we’ve always been a nation of leaders. Congressman McCotter is one of the great leaders in the House. His wisdom, his total wonkishness and his thirst for staying in touch with life outside the Beltway are great traits for a leader. If he isn’t on your radar screen, he needs to be. I strongly encourage everyone to read Sieze Freedom. I haven’t gotten my copy of it yet but I’ve read several excerpts, which I thought were exceptional. Will the American Enery Act Return? During the days of $4/gallon gas in the summer of 2008, then-Speaker Pelosi tried faking out the American people with a series of ‘drilling bills’ that really weren’t about expanding drilling. The bills were really about opening a tiny fraction of the OCS while putting the rest of the OCS offlimits forever. Leaving by example, Democrat Speaker Nancy Pelosi jetted off on her summer vacation under the assumption energy squeezed Americans would throng to buy her book, Know Your Power. But Americans weren’t buying it literally. Economically maimed by the pain at the pump, citizens demanded vacationing Speaker Pelosi and the Democrats’ ‘Don’t Care’ Congress get back to work and pass an ‘all of the above’ energy bill to lower gas prices. Unfortunately, the Sierra Club’s collective “we” included us. Not surprisingly, then, the Speaker’s latest lethargy proposal apes other energy schemes she’s brought to the House floor without amendment and under a super-majority vote requirement. Desperate to guarantee these bills’ defeats and blame Republicans, the Speaker orchestrated the nauseating spectacle of ‘Don’t Care’ Democrats, who a few months ago wouldn’t vote to drill a tooth, now hugging derricks instead of trees. This time, though, with a month of vacation under her Beltway, Pelosi’s ploy has a new wrinkle. In the media she is floating specious reasons why Republicans will vote against her radical cornucopia of energy insecurity. What she still fails to grasp, as with all her energy scams, is that the public will not be misled. Americans understand House Republicans’ bi-partisan ‘all of the above’ energy plan provides maximum American energy and, so doing, ensures lower gas prices and energy security. While the American Energy Act called for a robust increase in drilling for domestic oil, it truly took an all-of-the-above approach. Also included in the AEA was a plan for investing in energy-saving technologies, a heightened awareness for the need for conservation and alternative energies. With gas prices skyrocketing, I recently posed a question to a senior member of the House Republican Conference if we’d see a return of the AEA. This senior member assured me that the AEA’s return was inevitable. This is reassuring for a variety of reasons. First, we can’t continue to rely on foreign sources of oil. Shipping $400,000,000,000 a year to Middle Eastern governments is foolish and counterproductive. Second, drilling on the OCS and on the Bakken will create possibly a million great paying jobs at a time when our unemployment is unacceptably high. Creating a million jobs in the next year would shrink the deficit to almost sane levels almost instantly. Third, a significant investment by private companies into profit-producing technologies that would save energy would shrink demand for energy products while creating new manufacturing opportunities. Fourth, the Republicans’ all-of-the-above plan would significantly shrink our dependance on foreign energy sources, which would strengthen the U.S. from a national security standpoint. Fifth, getting the manufacturing sector of our economy growing is what the economy desperately needs. Manufacturing state-of-the-art conservation products would also automatically increase R & D budgets. The bad news is that militant environmentalist organizations like the Sierra Club would lobby Senate Democrats hard to defeat the bill or filibuster it to death. There’s a silver lining to that, though. A vote to continue a filibuster would be seen as a vote for higher gas prices. With 23 Democrats up for re-election, rest assured that that type of vote would put most of them on a hot seat. The other thing it does is it forces President Obama to take a position on increasing energy production. If he doesn’t pressure the Democratic Senate to pass the AEA ASAP, then Republicans will argue that he did nothing while gas and grocery prices skyrocketed. Good luck selling that in 2012. When the AEA is submitted, it’s important that House Republicans pass the AEA ASAP. I suspect that it would get alot of Democrat support, especially in states like Oklahoma, Colorado, Louisiana and Virginia. If there’s substantial bipartisan support in the House, which is likely, then Senate Democrats will have little political cover in not approving the legislation. It would put President Obama in a most precarious electoral position, too. For all these reasons, I hope the AEA will be submitted soon and quickly enacted.